You'll be able to pre-order the iPhone 7 on Friday (9th September), and the handset will hit the shelves on 16th September - that's just nine sleeps away! The iPhone 7 will cost £599 for 32GB, £699 for 128GB and £799 for 256GB. The iPhone 7 Plus price is £719 for 32GB, £819 for 128GB and £919 for 256GB. The 'iPhone Upgrade Programme' is available at UK Apple Stores with monthly payments starting at £33. The new Apple-designed wireless AirPods including charging case will be available for £159 from late October. Head over to T3's iPhone 7 Deals page to check out the best contract prices from the UK mobile providers. This one's not exactly a surprise: Apple has ditched the iPhone 7's headphone jack to make way for more important components. Instead, you'll have to use headphones with lightning connectors or Bluetooth cans. Apple will include a set of Lightning EarPods in the box with the iPhone 7, but it's also selling wireless AirPods. Apple AirPods are completely wireless headphones (not even connected to each other). They use Apple's brand new W1 Chip to do all the smart stuff. There's 5 hours of playback before the battery dies, and the compact wireless charging case includes a portable battery which adds 24 hours of listening fun. The case is charged by lightning. They can be used for phone calls, and they know if you're listening to both, or just one, to save battery. Beats is also launching W1 Chip headphones. If you have a pair of wired headphones you simply can't live without - Apple will also include an adapter in the box. How generous! The updated stereo speakers are twice as loud as the iPhone 6S. There's one at the top and one at the bottom for increased dynamic range. The iPhone has been trailing in the screen department for a while now, with its competitors using QHD and even 4K displays in their smartphone, while the iPhone didn't even have Full HD. Surprisingly, the iPhone 7 display didn't get a pixel bump, but it is now 25-percent brighter, and features a wider colour gamut which is 'cinema standard'. Of course, there's 3D Touch as well. 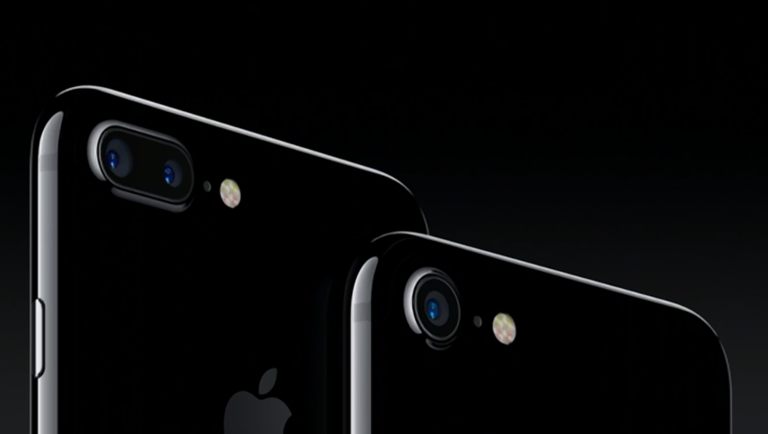 The iPhone 7 has an upgraded 12MP camera with larger pixels. The aperture opens stops down to f/1.8 and there's also optical image stabilisation, wider colour gamut capture, RAW file capture, and six lens elements to help you get better images. The iPhone 7 Plus features a new dual camera, this will allow you to get better depth of field in images. Both sensors are 12MP, one has a wide angle 28mm lens, the other has a telephoto 56mm lens. This allows for 2x optical zoom (rather than digital zoom, which should never be used). Now, you can digital zoom up to 10x. That second camera can also be used to create a more shallow depth of field, which blurs the background in images to make the subject really 'pop'. This feature will be available as a free software update later in the year. The new True Tone flash will no longer make you look like a pasty ghost, giving you an even skin tone in the darkest of locations. There's a new 7MP front facing camera, with wide colour gamut and image stabilisation, for better selfies and FaceTime. You can finally take your iPhone in that bath / drop it in the toilet / take it swimming, without need to worry! The iPhone 7 has IP67 ingress protection, meaning you can submerge it. It's not exactly a surprise what the new iPhone 7 looks like - it's been plastered all over the internet for weeks now. The new design borrows largely from the iPhone 6S, with rounded edges and that sleek Apple aesthetic we know and love. There are a few changes though - the antenna lines have moved to a slightly less conspicuous location (although, they are still there), and the camera is larger (and still protrudes from the body slightly). There are now five colour options to choose from, Silver, Gold, Rose Gold, Black and Jet Black. Jet Black is REALLY SHINEY. The iconic iPhone home button has been completely redesigned. It's now solid-state (meaning it's not longer mechanically 'clicky') and 'force sensitive'. It has a taptic engine, to make it feel like you're pressing a real button. The iPhone 7 comes packing Apple's new A10 Fusion quad-core processor which is 120x times faster than the original iPhone. There are four cores, two high performance, and two low-performance cores. The iPhone 7 will switch between these to achieve optimum performance and battery life. We didn't get specific battery details, but we were told it has the longest battery life of any iPhone - "two hours longer than the iPhone 6S". And finally, 16GB of storage is gone, there are now 32, 128, and 256GB options. The first big surprise of the night was when Nintendo's Shigeru Miyamoto came up on stage. The Japanese company will be bringing Mario games to the iPhone. The game is called Super Mario Run, it'll be paid for (not free to play) and released in time for Christmas 2016. There's also Mario Stickers for iMessage. Check out our iPhone 7 Poll! KGI Securities' Ming-chi KuoThere (who has a pretty good track record of these things) has released a metric tonne of details about the iPhone 7. Apple may use a proprietary wireless protocol for its AirPod wireless headphones, instead of Bluetooth. He believes there will be five colour options (Silver, Gold, Rose Gold, Dark Black and Piano Black). 16GB storage option is gone, 32GB will be the new entry level. The iPhone 7 Plus will have 3GB RAM to deal with the dual camera, the standard model will retain 2GB RAM. The dual lens camera system will comprise of a wide-angle lens and a telephoto lens, both 12MP. The iPhone 7 will feature IPX7 waterproofing. No headphone jack. Apple's A10 processor. The same wider colour gamut as the iPad Pro 9.7-inch. TrueTone flash. Potentially three models, the iPhone 7, iPhone 7 Plus, and iPhone 7 Pro. Definitely two. No headphone jack - leaked new iPhone 7 headphones below! How much will the UK iPhone 7 Plus and iPhone 7 price be? Before we get started, a few words about the new iPhone's name. Tradition is that after the iPhone 6S, the next iPhone will be called the iPhone 7 and iPhone 7 Plus. Of course, Apple could switch things up, some rumours suggesting the larger iPhone will now be called the iPhone 7 Pro, but we reckon it's still likely to be the iPhone 7 Plus. Maybe there will be three models, the iPhone 7 Mini, iPhone 7 Plus and iPhone 7 Pro? The Pro is quite possible, given that Apple has tried to breathe new life into the iPad with the iPad Pro. Why can't it do the same with a super high-end iPhone? This one's a no-brainer. Every iPhone going back to the iPhone 5 was released in September, so it doesn't take a genius to work out that the iPhone 7 should present itself in September (but it WILL make me look foolish if that's not the case). According to a 'reliable source', Apple may be bringing the iPhone 7 out earlier than previous years, but this was likely relating to the smaller, cheaper iPhone SE. It's now pretty much confirmed that the iPhone 7 will ready for pre-order on September 9, and then fully released on September 16 . Add it to your diaries folks! We think that the iPhone 7 announcement date will probably be September 5 or 6, but our buddies over at TechRadar reckon it'll be September 7. The cost of a new iPhone generally follows the same convention every new model. If that's the case this year, the iPhone 7 will cost around the same as the current iPhone 6S (and the iPhone 6S will get a £80/$100 price decrease). Previous new iPhones have shipped with brand new versions of iOS, the iPhone 7 will come running iOS 10 (we're currently on iOS 9.3). Whereas the iPhone 6S looked a lot like the iPhone 6, the iPhone 7 should be sporting a new design. Exactly how different is difficult to imagine, however, as the iPhone 6 seems like peak Apple design. Early rumours suggested Apple will ditch the camera bump and antenna lines. This will make the rear casing completely smooth and uninterrupted. That makes complete sense in our eyes. Elsewhere, it seems Apple could lose a few pounds thanks to a new slimmer LCD panel. What's more, Apple is said to be shrinking some of the internal components to make more room for a larger battery. Meanwhile, the leaks we've seen so far can't agree on whether the iPhone 7 is going to be waterproof or not - some say yes, some say no. Sounds like this one could go either way at the moment. Maybe it's RIP for the iconic home button? A new supply chain link suggests the iPhone 7 will have a capacitive button which also has 3D Touch. This was first rumoured back in June 2015 when it was reported that Apple was developing a touchscreen with an integrated fingerprint sensor. Take this with a pinch of salt, though, there's not much evidence out there yet. While these are renders from Martin Hajek, we think they look great, and can't decide which we prefer! There have also been rumours about a possible iPhone 7 Pro model. This includes a dual camera set up and 'pro' connector - similar to the iPad Pro. It looks like Apple has killed this model, though, deciding that it would add confusion to the range and citing possible production issues with the lens. Most of Apple's rivals have a QHD or 4K display whereas the iPhone 6S doesn't even have a 1080p HD screen, so a bump in resolution for the iPhone 7 would make sense. This rumour comes from a supply chain source speaking to DigiTimes, who suggests that Apple will make a jump back to glass-on-glass screens. This would allow a boost in resolution, and the ability to have a bezel-less display. iPhone 7 Edge, anyone? That streamlined bezel could lead to Apple ditching the 'clicky' home button in favour of a haptic feedback touch button instead, which would give you the sensation of a click rather than an actual physical click. This is similar to Apple's MacBook line of laptops - you think the trackpad physically moves when you click it, but it actually doesn't - it just gives you the sensation that it doesn't. This would result in fewer parts which could break, and take up less physical space. Sounds like a no-brainer to us. 6. Did someone say Apple A10 processor? and that the iPhone 7 battery will be bigger? Every iPhone comes with a speed boost, and we can't see that changing with the iPhone 7. There have been rumours on Weibo that the next iPhone will come packing the hexacore A10 chip (up from the dual-core processor in the 6S). Whether those turn out to be the exact details, who knows… But it will be faster than the current model, that's for sure. Another leak via Weibo (reported on MacRumours) in early August shows the iPhone 7's main logic board. There's nothing on the actual board to suggest the chip is the A10, but logic dictates that the iPhone 7 will be powered by an Apple A10 chip alongside an M10 co-processor. As you can see there is a chip in between the SIM slot and the A10 in this picture and we don't know what that is - this appears to be a departure from previous iPhone layouts. We can also expect to see 2GB RAM. It appears the A10 chip will be manufactured by TSMC alone. Samsung made some of the previous A9 chips alongside TSMC. The A10 will use the same 16-nanometer production process as the A9. It looks like the batteries will increase in size, with leaker OnLeaks claiming a reliable source informed him the iPhone 7 would include a 1960 mAh power pack. That;'s up from 1715 mAh in the iPhone 6S. While Apple is refreshing the internals, it seems they may get rid of that useless 16GB storage option from the range. This rumour comes from Chinese social media, and suggests that 32GB will be the new minimum. It looks like the iPhone 7 will have aptX Bluetooth audio like the Samsung Galaxy S7 and S7 Edge as well as the new Note 7. There are other leaked photos emerging of the processor, but we're not sure many of them are anything like accurate. Some reports suggest the iPhone 7 will be the thinnest device Apple has ever made, and that involves ditching the bulky 3.5mm headphone jack. Does Apple think the consumer is ready for the jump to Bluetooth or Lightning? It's certainly a bold move, but the plus side is you might get a second speaker out of it for better audio. Other rumours suggest Apple may opt to include a smaller, 2mm headphone jack, which Apple has a patent for - and which would then require you to use an adapter, or buy new headphones... which is even more of a pain. The iPhone 7 could also go without a charging port! Logitech has just let slip that smart connector in place on the iPad Pro models usually used for keyboard cases, can also transfer power. Seems unlikely this will feature here, but there is one reason this could pop up. If there was no headphone jack, Apple would HAVE to include a lightning cable adapter in the box. But then users should have to occasionally choose between charging and listening to music. The would be a slightly over-complicated way to solve that problem. Are these the new standard iPhone-bundled headphones? Probably not. The ear buds and in-line remote look genuine, but the lightning connector looks as fake a Gucci handbag sold on the street for £20. But these might be! Check out our main story on these iPhone 7 EarPods. READ: iPhone 7 headphone jack - is it going? And does it matter? 8. Could iPhone 7 have a dual camera? Trusted analyst Ming-Chi Kuo at KGI Securities believes the larger iPhone 7 Plus (or iPhone 7 Pro) may have a dual camera setup. If there is one, it may just be on the iPhone 7 Plus rather than the standard iPhone 7. And while that's just speculation, we can certainly see it happening. Apple tends to keep camera components for a long time, so expect the same 12MP camera module carried over from the iPhone 6S. It seems very likely that the camera will be improved in some way, so maybe optical image stabilisation will be standard across the range? Leaks from the supply chain seem to back up that rumour that the iPhone 7 Pro will have a dual camera, and a sizable camera bump. Apple is apparently testing a prototype with wireless charging, a rumour that comes straight from Chinese social network Weibo. But that's not the only model Apple is testing. Other prototypes include multi-Force Touch, a fingerprint scanner in the screen, and USB-C connector. No one knows which of these will make it to the market... if any. The wireless charging is certainly the most likely, even if it's not true wireless charging like the S7 has. Logitech let slip there might be an iPhone model which includes a smart connector similar to the iPad Pro. This would allow charging through it, possibly.